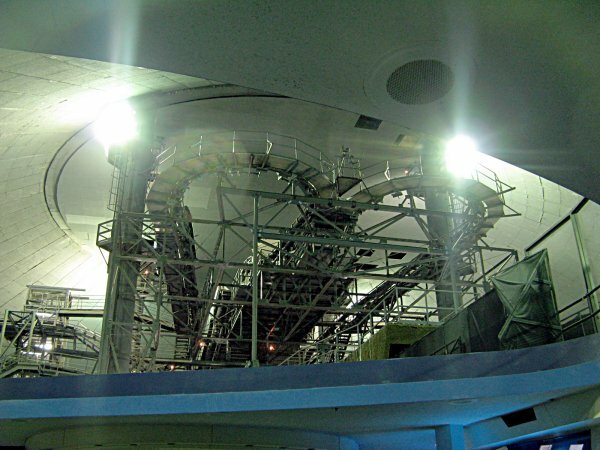 This Space Mountain lights article covers the indoor roller coaster that is located in Tomorowland at the Magic Kingdom, Walt Disney World Resort, Bay Lake, Florida. An overview of the ride with the lights off and lights on is given in this article. Space Mountain is a ride that is mostly dark, however, there are times when you can see the ride with the lights on. When does a Space Mountain lights on situation occur? The lights are likely turned on for the ride when there may be a problem or some other issue that Walt Disney World needs to take care of. This is usually the only time where you will see Space Mountain in the light. With the lights on you are able to see the track layout of the ride more clearly. If you are on the Tomorrowland Transit Authority PeopleMover and are at the Space Mountain section of the ride, you can also see the roller coaster clearly. Below we have located videos that showcase Space Mountain with the lights on. Above Space Mountain lights on Disney World photo by WillMcC on Wikimedia Commons. Photo released under a Creative Commons License. You can see Space Mountain with the lights on during the ride in a number of Space Mountain videos. Below we have gathered some of the best videos that will allow you to see the ride with the lights on. The first video is likely one of the best videos to see what Space Mountain looks like with the lights on. Following the first lights on video is another video of Space Mountain with the lights off, however, this time both sides (tracks) are shown in the video. The third video shows the ride with the lights on. The fourth and fifth videos show the ride back in 2006 with the lights on. Videos six and seven show Space Mountain with the lights on from the Tomorrowland PeopleMover. The main lighting configuration of Space Mountain is to have the lights off during the ride. With the lights off, Space Mountain can be more interesting as it is hard to see all of the turns and drops. The ride is not totally dark, however. During the main portion of the ride there are stars, asteroids, and possibly planets that are projected on the ceiling of the ride. Also the beginning portion of the ride and the second tunnel are lighted and are not totally dark. You can see Space Mountain with the lights off in the videos below. More information on the ride can be found on our other Space Mountain Walt Disney World pages.